Here to Help Learning has two distinct tracks—paragraph writing - geared to 1st to 3rd grade students, and essay writing for older (4th to 6th) ones. I liked that the levels are not labeled by grade. This means that the student has the potential to work at where he is, and isn't left to feel stigmatized by the grade level assigned. For example, Jude began with Paragraph Writing, Flight 1. Even though he's in 3rd grade, he's just learning to write paragraphs. (Some days, I'm happy he uses subject-verb-object sentences!) You certainly could start an advanced writer further on, but he readily accepted "This is a new program, let's start at the beginning." Each of the tracks contains three "Flights". Each flight covers six assignments and is intended to last approximately one "school year." 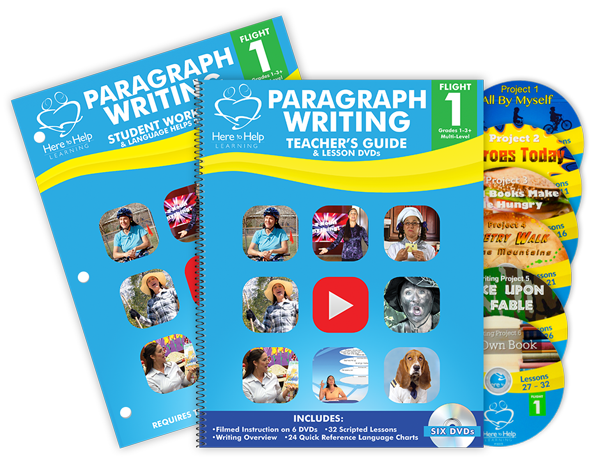 This means that the Paragraph level students will complete six paragraph assignments, and the advanced Essay Writing students will complete six essays. Students are expected to work on this class two-ish days per week. On the first lesson day, they are to watch a video (15 minutes running time; about 30 minutes per lesson including stopping time to complete during-video activities) presented by Beth Mora, and use a second day to complete the work assigned in the video. 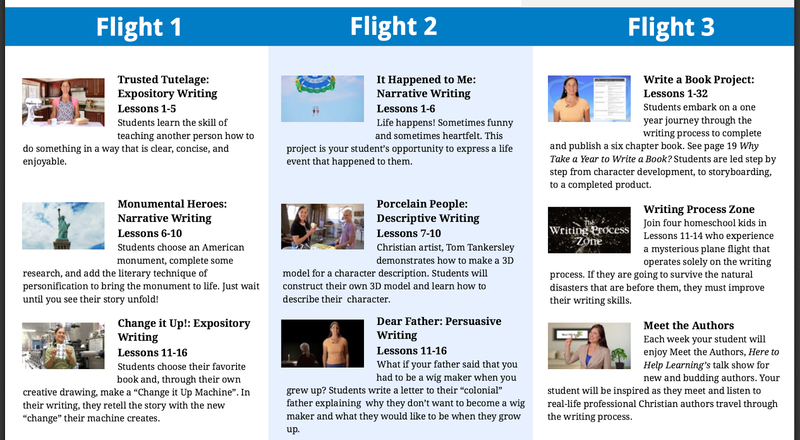 Here to Help learning uses a nine-step approach to writing assignment, starting with brainstorming and ending with publishing. Each project is developed over the course of five or six lessons. Over the course of study, the student will be exposed to (and will practice) a number of different writing genres. How long it really takes to complete each lesson's work may depend on your child. Jude took the video day plus two or three more days to complete the assignments. I don't think they were particularly hard -- he just took a while to grasp things. Celia gave the program a try as well. She's my in-schooler, and her Language Arts teacher assigns a "Paragraph of the Week" twice a month. Even with lots of practice, Celia still sometimes struggles with paragraph writing, especially with organizing her thoughts. She also started with Flight 1, but completed the first full assignment in only two weeks. She then went up to the Flight 2 level, and found that she still could comfortably manage 3 lessons every 2 weeks. Each video begins by going over the key Bible verse and the writing process. Beth Mora demonstrates the activities that the parent/teacher should do with the students in one of her many "character often includes other students. After each demonstration, Mora tells you to pause the film and do the activity before starting it up again. and ends with assigning the “flying solo” work. Jude thought the videos were fun. Celia, however, thought they were too slow, and even complained she was bored. She thought they were a little baby-ish for older kids. She said she understood why Ms. Mora taught in that style, but she felt that if an older student was struggling and trying to "catch up", the student might feel "embarrassed or like a dummy." I was hopeful that Here to Help would be of more help. This program breaks down writing into manageable and chunks - first a simple "about me" paragraph, then increasing in complexity until the student is capable of writing a short book. I like how it is organized. However, with video presentations that felt too caricature-ish for much of the target age range, the execution fall short for us. To find out more about Here to Help Learning's program, you can follow their blog or their social media channels. For other reviews, click the banner below.